Strategies for Collaborating With Children: Creating Partnerships in Occupational Therapy and Research applies client-centered and strengths-based theories to pediatric practice. The text is organized using a research-based conceptual model of collaboration. Within this text, there are detailed descriptions of how to engage and work with children aged 3 to 12 years, from the beginning to the end of therapy. Dr. Clare Curtin covers a variety of topics, such as how to interview children, involve them in defining the purpose of therapy, and develop self-advocacy. Similarly presented is the therapist's role as a guide in setting respectful limits, teaching self-regulation, avoiding power struggles, and co-creating educational experiences that are challenging and fun. Strategies for Collaborating With Children: Creating Partnerships in Occupational Therapy and Research advocates for children's rights and participation in therapy and research. The United Nations Convention on the Rights of the Child, the new sociology of childhood, and childhood studies are discussed. Also included are children's perspectives on what therapists should know and what children said they might be thinking at each stage of therapy. The last chapter focuses on methods to enhance children's participation in research, including adaptations for children with disabilities. Unique features:*Describes a new research-based model of collaboration with children *Incorporates children's views and knowledge about therapy *Illustrates the use of client-centered and strengths-based theories as well as child-friendly approaches within pediatric practice *Provides over 1,600 practical strategies that are exemplified by stories with actual dialogue *Describes ways to involve children throughout the research process *Identifies verbal, visual, and activity-based participatory research methods for eliciting children's voices, including creative ways to involve children with different levels of abilities *Includes review questions at the end of each chapter Instructors in educational settings can visit www.efacultylounge.com for additional material to be used for teaching in the classroom. 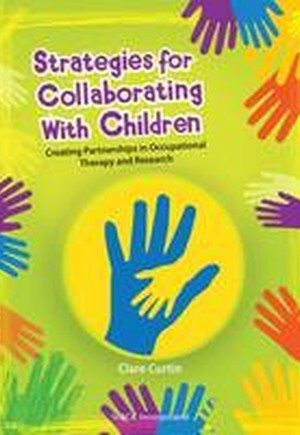 Strategies for Collaborating With Children: Creating Partnerships in Occupational Therapy and Research delivers a comprehensive resource for collaborating with children for the occupational therapist, occupational therapy assistant, or any other practitioner working with children in a therapeutic setting.